Your dinners will be the talk of the town with this scrumptious roasted lamb served with a tangy tamarind-infused tomato gravy. Asian spices and flavours make it unforgettably mouth-watering. In a mixing bowl, mix well all ingredients and marinate lamb rack overnight. In a pan, sear the lamb rack till caramelised. In a pot, stir fry garlic, curry leaf and mustard seed with oil till fragrant. Add in carrots, potatoes and roast till caramelised. Add in Knorr Rendang Paste, Knorr South East Asian Spice Paste. Stir fry till fragrant. Add in Knorr Pronto Tomato Sauce, bring to boil and let it simmer for 10 mins. 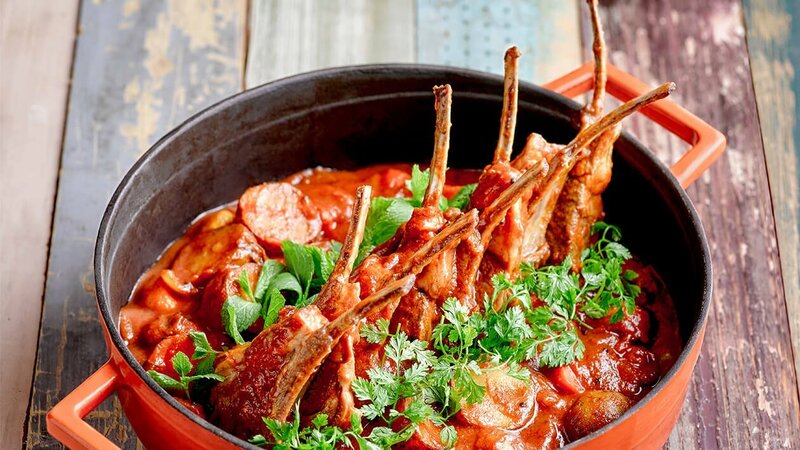 Fold in Knorr Concentrated Tamarind Sauce and simmer lamb rack in sauce. Rest lamb rack and portion it. Plate lamb rack, vegetables and drizzle sauce over it.